Sealed with a handshake beamed across the world, the 1993 Oslo Accords were the first agreements between the rival Israelis and Palestinians and promised to end decades of deadly conflict. The deal's architects -- Palestinian leader Yasser Arafat, and Israel's premier Yitzhak Rabin and foreign minister Shimon Peres -- won the Nobel Peace Prize for "their efforts to create peace in the Middle East." 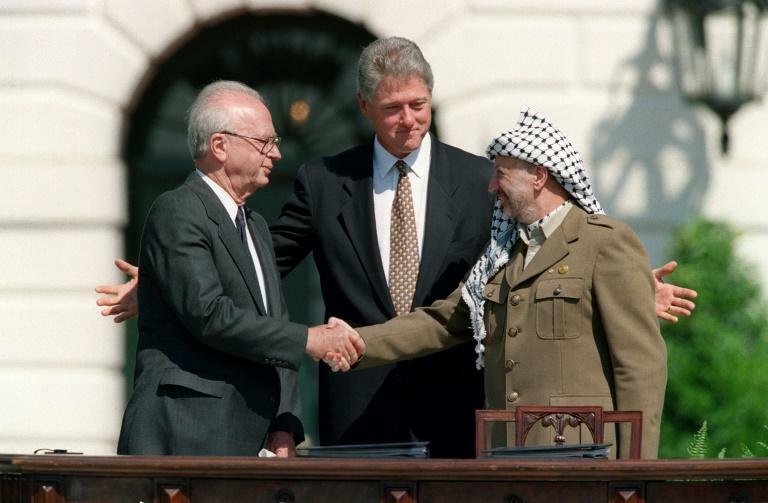 The all-smiles image of Arafat shaking hands with Rabin was a moment of hope, but 25 years after that bright day in Washington, relations between the two sides have soured and the deal -- which envisaged eventual Palestinian autonomy -- is deadlocked. 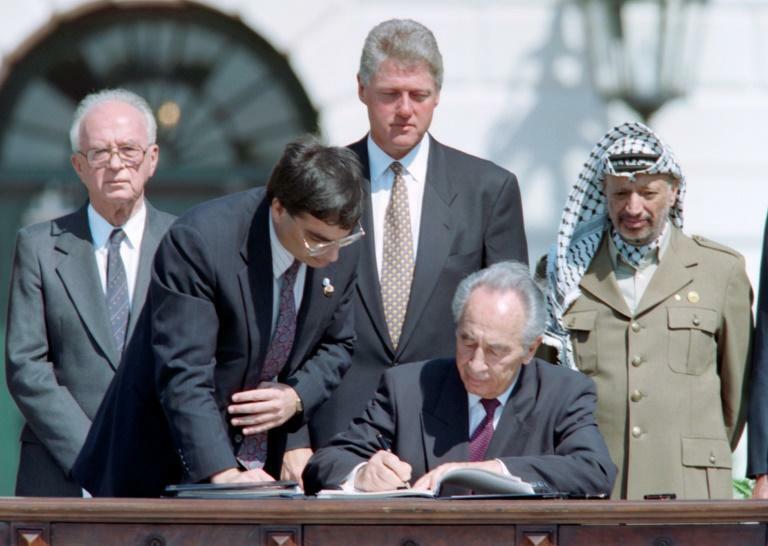 Here is a look back at the landmark Oslo Accords. In 1991, with a bloody Palestinian intifada uprising against Israeli occupation having raged for four years, Washington and Moscow call a meeting in October in Madrid. For the first time Israelis and Palestinians sit around one table together, although via a Jordanian delegation as Israel refuses the direct participation of the Palestinian Liberation Organisation (PLO). The meeting opens the path to Oslo: bilateral and multilateral negotiations follow in various countries although there is no real progress until 1993. In January 1993, Israel removes a major obstacle to further negotiations by lifting a 1986 ban forbidding Israeli contact with the PLO. At the same time Norway offers to host fresh talks, guaranteeing utmost secrecy away from the media spotlight. Oslo, which espouses mediation of international conflicts, leans on its long-running contact with Arafat and close links between its ruling Labour Party and that of Israel. From January to August the feuding sides hold at least 14 under-the-radar meetings in the Norwegian capital. The first public sign of a breakthrough comes on August 29 when Israel announces a groundbreaking agreement allowing limited Palestinian autonomy in parts of the Gaza Strip and West Bank, which had been occupied by Israeli forces. Then on September 10 Israel for the first time officially recognises the PLO as the representative of the Palestinian people. These are the pillars of the Oslo Accords. The "Declaration of Principles on Interim Self-Government Arrangements", set to last five years, also states that the Israeli government and PLO agree to work to end their conflict. According to the text, both sides will "recognize their mutual legitimate and political rights, and strive to live in peaceful coexistence and mutual dignity and security and achieve a just, lasting and comprehensive peace settlement". The deal is signed by its chief negotiators, Peres and PLO official Mahmoud Abbas, in Washington on September 13. But the heroes of the day are Arafat and Rabin: at an official ceremony on the White House lawn the same day -- with US president Bill Clinton and some 3,000 invited guests watching -- the old foes stand side-by-side, Arafat puts out his hand, Rabin hesitates then does the same. The handshake was hailed by many as a vital breakthrough in a conflict that had already lasted nearly a half-century, but there was also criticism from Palestinian and Israeli quarters and some Arab countries. In May 1994 the transitional Palestinian autonomy begins. Two months later Arafat returns to the Occupied Territories after 27 years in exile. He forms the Palestinian Authority, which is to oversee the road to aspired Palestinian statehood. In September the following year a new intermediary accord, known as Oslo II, is signed, on the extension of the autonomy in the West Bank. But on November 4, 1995, a right-wing Jewish extremist opposed to the accords assassinates Rabin. It is a major blow to the deal. Arafat progressively becomes the bete noire of the Israelis, who blame him for a second Palestinian uprising in 2000. The last direct -- but ultimately fruitless -- negotiations sponsored by the US take place in 2013. Twenty-five years on the Oslo Accords are deadlocked: the West Bank remains occupied while the Gaza Strip is in the hands of Islamist movement Hamas and under Israeli blockade.